Merce Amor is secretary at the charity Dialegs de Dona, a migrant women’s cooperative which provides a space for meetings and socialising. It was founded in 2013 to contribute through female intercultural dialogue to the social cohesion of the neighbourhood of el Raval and the city of Barcelona. Albert Arias B.A. Geography. M.A. Urban Management. Currently PhD candidate in Tourism studies at the Rovira i Virgili University (Tarragona, Spain). His on-going dissertation deals with the enactment of tourism in Barcelona through the analysing of the controversy surrounding the enclosure of the Park Güell. He is particularly interested in how to incorporate hybrid relationality and non-representational approaches to urban and tourism management. He is currently the Head of the Tourism Strategic Plan of Barcelona. Carlos Delclos – works at the Center for Contemporary Culture of Barcelona and collaborates with the Health Inequalities Research Group at Pompeu Fabra University (UPF) in Barcelona. He received his PhD in Sociology from the UPF and his research interests include social stratification, urban studies, migration, demography and social change. His work has appeared in such media outlets as Cadena SER, Radio Nacional de España, ElDiario.es and Open Democracy, among others. Stefano Faiella was born and raised in Rome to an Italian father and a Scottish mother, Stefano moved to Glasgow where he studied Building Design Engineering and Integrated Building Design at Strathclyde University between 1998 and 2004. A qualified architect since 2005, he is a Director and founding member of Threesixty Architecture (http://360architecture.com/). His currently involved in a number of projects with a particular focus on city centre retail & leisure as well as Residential and Masterplanning projects. Angelina Göb, is a postdoctoral researcher at the Academy for Spatial Research and Planning (ARL, Hannover). She has worked as an urban planner following her degree in geography (Rheinische Friedrich-Wilhelms-Universität Bonn). Her thesis dealt with perception and use auf mobile phones in public spaces by using a research design made up of different qualitative methods for example photography and time scheduling. Lars Frers is Professor for social sciences at University College of Southeast Norway. Frers’ research revolves around the materiality-space-motion nexus, with a special interest in how qualitative methods can give access to everyday life, social control and the senses. Frers has published a book on railway terminals, he has co-edited two volumes in the field of urban studies, a special issue of Cultural Geographies on the topic of absence in 2013, and a forthcoming special issue of Space and Culture on the limits of resistance in public space. Mateu Hernández is the CEO of Barcelona Global. Mateu is member of the International Advisory Board of the 4th New York Strategic Plan, Secretary of the International Advisory Board of the Smart Cities Expo and Congress, regular advisor for economic development and strategic plans for cities, and is Senior Advisor of SONAR, the advanced music and technology festival. Previously, he was the CEO of the Economic Development Agency of the City of Barcelona, where he coordinated policies and programmes in Barcelona on employment, entrepreneurship, business, attracting foreign direct investment, the city’s brand, technological innovation, promotion and trading standards, city markets, and tourism. As managing director of the Economic Development Agency, he was the executive Vice President of Barcelona Activa, Mercabana, and had executive responsibilities in the 22@ innovation district. Mateu graduated from executive programmes in Business Administration from IESE, and he also graduated in law from the University of Barcelona and has a Masters in Public and Social Policy from the Pompeu Fabra University and Johns Hopkins University, Baltimore. Stephane Laidet is responsible for sound at the Theatre of the Senses. He creates auditory landscapes and the music scores for the theatre plays. For 25 years he has toured with French, English and Spanish groups and has worked in TV (Canal+) and advertising (Martini). He has recorded 20 albums. In 2004 he meets Enrique Vargas and the Theatre of the Senses and works with the company as actor, designer of auditory landscapes, musicion or composer. He offers workshops in sensory theaters exchanges and lectures on sensory language and play poetics and the University of Girona. Giovanna Pezzullo is an actor, scriptwriter, teacher in sensorial language and smell designer. She studied art in the Universitá Statale di Milano and gets trained as an actor at Escuela de Arte Dramático Il Piccolo de Giorgio Strehler.Since 1999 she works with the Compañía Internacional Teatro de los sentidos, directed by Enrique Vargas. She has acted, coordinated and participated in the creation of plays and olfactory landscapes of the folloing plays: El vino, La bodega de los sentidos, El eco de la sombra, Oráculos, Pequeños ejercicios para el buen morir, Filatura, El mundo al revés, Fermentación, Renacer, Heart of darkness. She coordinates the master “Imágen sensorial y poética del juego” organized byFundació Universitat de Girona y Caixa d’Eines del Teatro de los Sentidos and teaches in many European countries. She has created her own olfactory methodology which she teaches in workshops. Teresa Perez is the Public Relations Officer of the Centro de Cultura Contemporanea. She also runs the project Alzheimerart at the CCCB. Joan Roca i Albert (Girona, 1958) is a geographer and urban planner, and has been the director of the Barcelona City History Museum (MUHBA) since 2007. He has dedicated himself, from research and teaching, to the field of urban history. 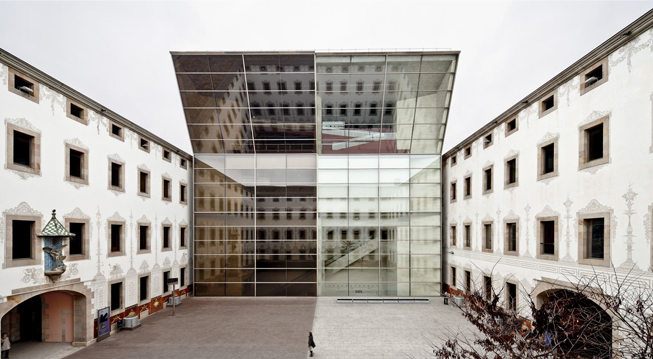 He has taught at the ICE of the Universitat Autònoma de Barcelona and at the Barri Besòs Institut. He has been a fellow lecturer of the Hochschule für Gestaltung und Kunst of Zürich, of the Barcelona History Seminar (Historical Archives of the City) and of the Independent Studies Program of the MACBA. He has edited the series Model Barcelona (1999-2006) and has coordinated several research projects on industrial heritage and the representation of the city. He directed Aula Barcelona (University of Barcelona) and the Urban Majorities Project 1900-2025 (Fundació Antoni Tàpies, 2006-2007). Co-author of The Future of Urban peripheries, 1994 (Barcelona City Award) and of The study of the industrial heritage of Can Ricart, 2007 (Prize Bonaplata) and coordinator of “The formation of the industrial belt of Barcelona,” “Urban expansion and Planning in Barcelona”, “The municipality of Barcelona and the fighting for the city government” and “The social articulation of contemporary Barcelona” (1995-1997). Among his recent writings, we can stand out “The arrival of the Pyrenean electricity and territorial decisions in Barcelona in 1914″ (2001); “The building dictatorship of Cambó. From the projects in 1905 to the 1914 decisions” and “Le front de mer de Barcelone. Chronique d’une transformation “(2002); “The attraction of Barcelona, migrations of the twentieth century” (2003); “Has Barcelona ever been a big industrial city?” and “The route as an art form” (2004); “A country in search of portraits” (2006), “Metropolitan Images of the New Barcelona” (2007, co-author), “Miejsce Barcelony wcywilizacji europejskiej (Barcelona in the European civilization)” and “The metropolitan kneecap of the Besòs. A long history “(2008),” The History Museum of Barcelona, portal of the city “and” the three metropolitan cycles of Barcelona “(2009); “Urban Inclusion and Public Space: Challenges in Transforming Barcelona”, “Archaeological intervention, historical speech and monumental making in Barcelona” (2010), “The risks of new urban dimension” and “Water, power and city. From history to heritage “(2011),” Barcelona in 1950 Reconstructing the Future “and” Strategies of insertion and interconnection of Barcelona as a modern metropolis “(2012). Cathy Ross is Honorary Research Fellow at the Museum of London. She was former Head of Collections of the Museum of London and has recently been the exhibition curator for: ‘Philanthropy: the City Story': held at The Charterhouse, November 2013; ‘Germans in Britain’, for the Migration Museum Project: first shown at the German Historical Institute, November 2014. She is also Project Curator for ‘Revealing the Charterhouse’, 2013 – 2016: a collaboration between the Charterhouse and the Museum of London to open up the historic complex to greater public use. Albert Sales is a political scientists and sociologist. He is associate Professor at the Department of Social and Political Sciences of the Universidad Pompeu Fabra. He is an activist and researcher in the areas of poverty and inequalities. He has researched the vulneracion of human rights by transnational companies in the South East of Asia and the North of Africa. He has acted as a consultant for the Network of Homeless People in Barcelona. Currently he is supporting Barcelona Council in the design and elaboration of social intervention policies in public spaces. Ilaria Sartori is an ethnomusicologist, sound anthropologist and culture professional. She has a bachelor’s degree in the conservation of cultural heritage and a PhD in history and the analysis of musical cultures, and is a specialist on Ethiopia and Muslim cultures. Since 2002, she has worked on researching, documenting, disseminating, conserving and evaluating cultural heritage. She collaborates with universities, cultural institutions, museums, schools, archives, libraries, festivals, artists and researchers through conferences, workshops, sonic and multimedia maps, articles, expositions and other scientific, academic, cultural and artistic activities. Joan Subirats is professor in Political Sciences at the Autonomous University of Barcelona. His areas of research include governance, public management and the analysis of public policy, and he has also worked on social exclusion, democratic innovation and civil society. He held the chair of Principe de Asturias at the University of Georgetown 2002-2003. He was founding director of the Institute of Government and Public Policy (IGOP). He has published books about governance, public policy and democratic innovation, the internet and politics. His latest book is Decisiones Públicas. El análisis y estudio de los procesos de decisión en políticas públicas, with Bruno Dente, published by Ariel (2014).He frequently writes for Spanish media, such as El País, Público, El Diario and the Cadena SER. Marta Tafalla holds a PhD in Philosophy and is Lecturer in Aesthetics and Art Theory at the Universitat Autònoma de Barcelona. She is the author of Theodor W. Adorno. Una filosofía de la memoria (Herder, 2003) and editor of the anthology Los derechos de los animales (Idea Books, 2004). Her work on multisensory aesthetics has been published in international journals as Estetika, Contemporary Aesthetics, The Anatomical Record and Percepnet. She is also the author of two novels, La Biblioteca de Noé (Herder, 2006) and Nunca sabrás a qué huele Bagdad (UAB, 2010), which deals with the experience of anosmia. Anna Terra is the Director of the Departament de Projectes Estratègics de Foment de Ciutat of Barcelona’s City Council. Foment is a private-public company set up with the objective to execute all the planning and building activities planned within the scope of transforming and revitalising the Ciutat Vella District. Carolina Vasilikou, is an Architect and Associate Lecturer at the University of Kent teaching urban design and sustainable architecture. She holds an M.Sc. in Façade Design & Engineering from the University of Bath and a Ph.D. in Architecture from the University of Kent. Carolina currently conducts sensory research based on primary fieldwork funded by an AHRC Cultural Engagement Fellowship and EPSRC CCN+ (Sensory Navigation in Heritage Cities). Her research work focuses on thermal and sensory perception and urban comfort of pedestrians in complex urban environments. Carolina is active in people-centred and evidence-based design and research and is currently a member of the Centre for Architecture and Sustainable Environment at the University of Kent, Architecture et Climat at Université Catholique de Louvain, Working Group 5 of the EU COST Action People-Friendly Cities in a Data-Rich World Project and the Academy of Urbanism. Rita Wagner (M. A.) is the curator for the Graphics Departments of Cologne City Museum. She studied Modern History, Sociology and Journalism at Mὒnster University. She has been working since 1984 at the Cologne City Museum and her areas of expertise are: photography, painting, fashion and textile, and Cologne’s history since 16th century (especially social history and history of gender). Furthermore, she is responsible for the permanent exhibition of the museum and participating in the planning of the museum’s new building near Kὄln’s cathedral. Currently she is preparing her next exhibition „Cologne unvarnished. Wilhelm Scheiner as a photographer“ (1880–1914) and its catalogue (to be displayed in November 2015).